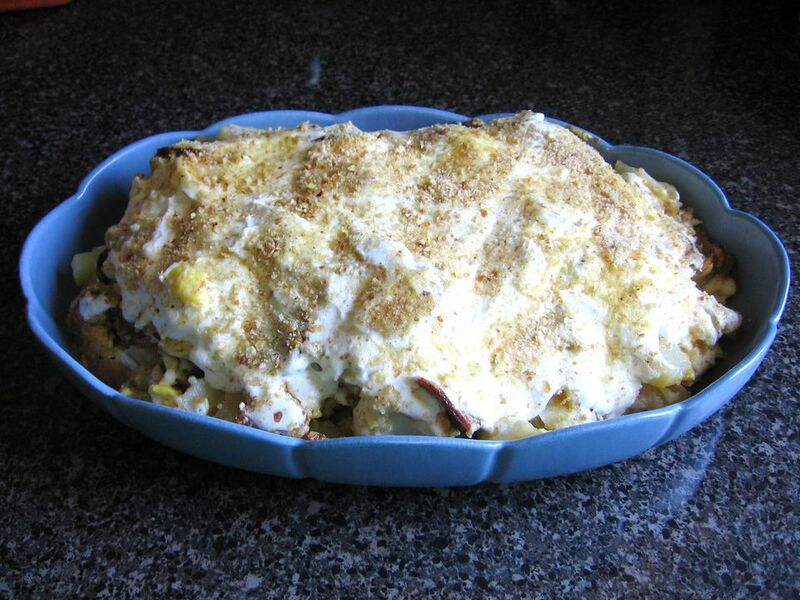 Smoked Hungarian sausage is the star in this one-pot comfort food dish of layered potatoes and hard-cooked eggs smothered in sour cream and bread crumbs, known as rakott burgonya (RRAH-koht BOORR-gohn-yoh). It can be served as a luncheon dish with a green salad, as a main course or as a side dish. Heat oven to 350 F. Butter bottom and sides of a large casserole dish with a lid. Sprinkle with breadcrumbs. Arrange 1/3 of potatoes in bottom of casserole dish and dot with 1/4 of butter. Cover with 1/3 of eggs. Season with salt and pepper. Cover with 1/3 of sausage followed by 1/3 of sour cream. Continue layering, ending with sour cream. Cover with an even layer of bread crumbs and dot with remaining butter. Cover with lid, place on a lipped baking sheet to catch any drips and bake 20 minutes. Remove cover and bake an additional 15 minutes or until golden brown and bubbly. Let rest at least 10 minutes before serving.